From Dept. 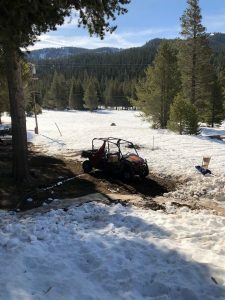 of Water Resources – Following one of the driest Februaries in California history, late winter storms increased the Sierra Nevada snowpack but were not enough to put the state on track for an average year. Today’s snow survey by the California Cooperative Snow Surveys Program indicates that water content in the statewide mountain snowpack increased from 23 percent of the March 1 average to 52 percent of today’s historical average. The early-April snow survey is the most important for water supply forecasting because the snowpack is normally at its peak before it begins to melt with rising spring temperatures.